Thunder shock Rockets | Daily Express Online, Sabah, Malaysia. 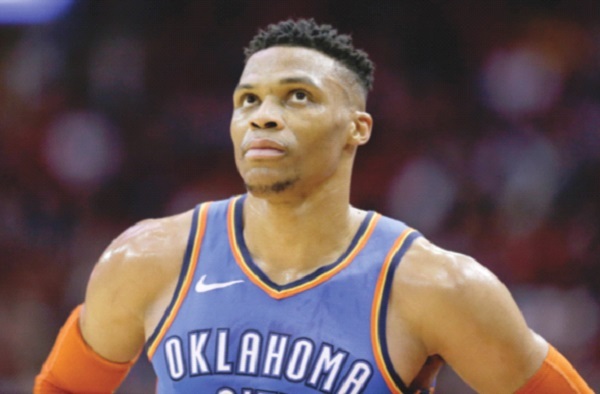 LOS ANGELES: Russell Westbrook (pic) matched the NBA record with a ninth straight triple-double and Paul George scored 15 of his 45 points in the fourth quarter Saturday as the Oklahoma City Thunder roared back from a 26-point deficit to beat the Houston Rockets. Westbrook had 21 points, 11 assists and 12 rebounds. His ninth straight triple-double—reaching double figures in three key statistical categories—matched the record set by Wilt Chamberlain in 1968. Westbrook connected on just eight of 21 shots from the field. But his effort was enough to help the Thunder to the win despite a 42-point performance from Rockets star James Harden. Harden produced 30 points for the 29th straight game—two shy of Chamberlain for the second-longest streak in league history but still a long way away from Chamberlain’s record stretch of 65 straight 30-point games. Harden made 11 of 28 shots from the field and 14 of 15 free throws, but the streak took a backseat as the game evolved into a fourth-quarter dogfight. The final period featured seven lead changes. Westbrook’s layup put Oklahoma City ahead 113-112 with 26.9 seconds left to play. Harden then missed a three-point attempt and George corralled the rebound and was fouled. He made two free-throws before Houston turned over the ball and the Thunder held on for the win. The Rockets had appeared headed for a romp when they took a 70-48 lead into halftime. But they made just six of their 18 shots in the third period, including just one three-pointer.